The iFIT-1 Speaker is an inexpensive step-up from the built-in speakers in most smartphones. Its lithium-ion battery is charged with an included micro-USB to USB cable when attached to your computer. A hidden pull-out shelf serves as a convenient vertical or horizontal iPhone stand. 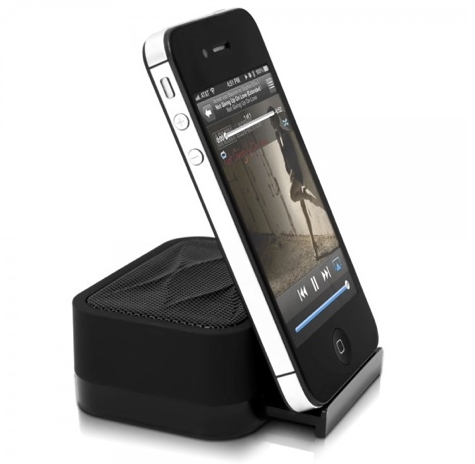 The speaker works well with an iPad but becomes too top-heavy to be practical when used with the stand. The input cable, with a standard 3.5mm plug, fits snugly in a channel on the bottom of the unit for storage. A full charge from empty takes a couple of hours and will power the speaker for up to six hours according to the documentation. The iFIT-1 Speaker is very portable due to its pocketable size: 3″ x 2-1/4″ x 1-1/2″. However, the driver is only 2″ in diameter. At this diminutive size, the sound quality is pretty tinny. Don’t expect room-filling, boombox sound from this tiny unit. Voice reproduction is acceptable. If you listen to audiobooks or podcasts, this might be a good choice. This is also ideal for video-chatting because of the stable stand. There are conflicting opinions regarding rechargeable devices. Batteries can be replaced the minute a device runs out of power, but it’s not environmentally friendly to send used batteries to the landfill. Rechargeable devices are better for the environment, but if you are away from a power source and you run out of charge, you’re out of luck. The iFIT-1 Speaker uses the latter option. This compact speaker is nicely designed and well constructed. It may fill a few needs but the sound quality is far from ideal.